The winter of 1976 was an unusual one for Mid-Atlantic Championship Wrestling fans in the Richmond, Virginia area. But maybe a brief look at the history of Mid-Atlantic Wrestling in Richmond will help explain why that was the case. Richmond, Virginia was at the geographical northern extreme of the Mid-Atlantic Championship Wrestling territorial boundaries. During the Mid-Atlantic years, our night for wrestling was every Friday night. Friday night was probably the best possible day of the week to have a card regularly running in your city. Through early 1974, wrestling in Richmond was at the State Fairgrounds at Strawberry Hill on Friday nights. Then, in the spring of 1974, Mid-Atlantic Wrestling was put on regularly at Parker Field (an outdoor baseball stadium that housed the Atlanta Braves’ Triple A farm team, the Richmond Braves), the Richmond Arena and the Richmond Coliseum. The Richmond Arena was a rundown city owned facility that was dark and dingy. There were posts and beams everywhere, thus making it difficult to get an unobstructed view of the ring at all times. And did it ever get HOT in the summertime at the Arena! The Arena held approximately 4,500 people for wrestling. Jim Crockett Promotions held cards at the Arena for about three years, until the middle of 1977 (plus several cards in 1981 when the Coliseum was undergoing renovations). The Arena typically had "lesser" cards than the Coliseum, getting the Friday nights when the Coliseum wasn’t booked, but World Champions came to the Arena and titles occasionally changed hands there. 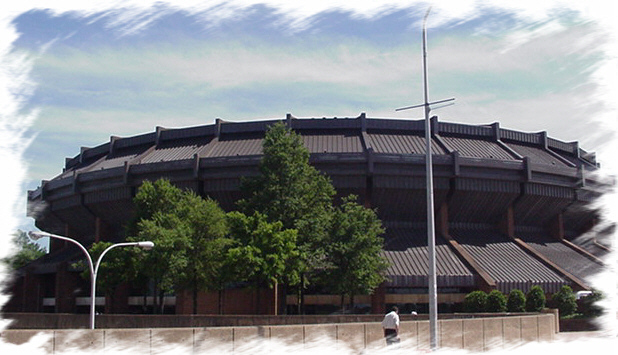 The Richmond Coliseum was Richmond’s largest venue, having a capacity of nearly 11,000 during the Mid-Atlantic years. Many historical matches and moments occurred at the Coliseum, and arguably this building was second only to the Greensboro Coliseum in its housing of great Mid-Atlantic cards. The Richmond Coliseum never held more than two cards per month, making the events that did come that much more special. Folks in the outlying areas around Richmond also got to see wrestling on Friday nights when neither the Coliseum nor the Arena were booked. Essentially, these cards were in smaller towns that the local affiliate WTVR-TV Channel 6 could promote and reach with its signal. I’ll just mention a few of these towns, as there were many. To the east of Richmond were Tappahannock and Saluda. To the south of Richmond were Colonial Heights and Petersburg. To the west of Richmond were Charlottesville and Harrisonburg. To the north of Richmond were Fredericksburg and Stafford (the latter two coming perilously close to the Washington, D.C. metropolitan area and the WWWF). What was strange about the first three months of 1976 was the lack of live matches in the city of Richmond. There were two Fridays with no wrestling in January, and in the months of February and March there was only one card in the city each month. Luckily, things got back to normal in April, and Friday nights were wrestling nights again! Despite the lack of live action in Richmond during the first quarter of 1976, I still have a lot of lasting memories of that time frame. Ric Flair making his in-ring return to Richmond on February 21 after the plane crash. Ric looked as though he had lost so much weight, but seemed to move better than ever. Angelo Mosca beating the great Chief Wahoo McDaniel on January 23, with a little help from a friend (at that time a still recuperating Ric Flair who was in Mosca’s corner for that match). Wahoo coming back and winning the Cadillac Tournament at the Coliseum on March 19. In a general sense, I remember thinking how imposing and frightening the new team of the Mongols were. I know I was fully expecting them to become tag team champions at some point, but of course that never happened. I also think back as to how great Blackjack Mulligan was going during this time frame. But I never really thought he had the "stuff" to be United States Champion. Did he ever prove me wrong! I think back to being shocked when Gene and Ole Anderson dropped the World Tag Team Titles to Wahoo and Rufus R. Jones, but feeling that order was restored when the Anderson’s reclaimed the belts two weeks later. I recall how impressed I was with the new World’s Champion, Terry Funk, when he actually wrestled on Mid-Atlantic television. And I was perplexed at how main event wrestlers in December of 1975 were jobbing in January of 1976. Such was the plight of Ken Patera, Steve Keirn and Steve Strong. While in the winter of 1976, Mid-Atlantic Championship Wrestling brought some great action to Richmond, I think the spring of 1976 was even better. There were certainly more live matches to attend on Friday nights! Look forward to reminiscing about the spring of 1976 in Richmond with you soon. Until then, so long from the capital city!